You've spent years studying the clown arts, how to entertain a group of 8 year olds, how to make a crying baby happy again, how to distract from a crying baby when that doesn't work, every class! No one appreciates how difficult it is to get into clown college. Your parents are dismissive, your significant other... well, what significant other? You've been too busy all these years studying, following your passion, there hasn't been time for romance, or even meeting people outside of your clown class. Now you've graduated and you need the right outfit! You've truly earned this timeless colorful classic. 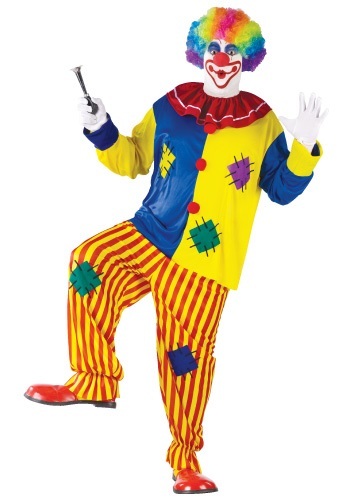 This costume features circus-like red and yellow striped pants with patches and a block color blue and yellow patched shirt with a red collar. The hours and hours of clown night school, the endless homework, even how Clown Bozo would needle you about your imperfect balloon giraffe, it was all leading up to this ensemble. Bozo is gone and your giraffes are flawless. It's time to shine... those giant shoes of yours. You want to look good, don't you? So put them all on notice. That's right, everyone: the birthday parties, the bar/bat mitzvahs, the dog parties, even the book clubs! It's time for you to be celebrated for your skills. It's time to stand up and declare "Yes! Now is the time of the clown!" You think that big red nose is easy to put on day after day? Of course not. It's the hardest job in the world. But you do it because you love it. You do it for the smiles on all those little faces. You do it because darn it someone has to, and you're the only clown big enough for the job. So make those people smile!